Boxer Dog Characteristics: The eager and plucky Boxer Dog is a breed of medium sized dog, classified as a member of the Working Dog Group (AKC:1904). The Boxer Dog, is characterized by its sturdy, square built appearance with a smooth, wrinkle-free head and energetic expression. Other characteristics include dark, medium sized eyes; high set, pointed ears; short high set tail and a fast, fluid gait. The temperament of the Boxer Dog can be described as Energetic, Fearless, Loyal. The coat type of the Boxer Dog is described as short, smooth coat in brindle, fawn, white colors. Due to its characteristics and qualities, the Boxer Dog demonstrated the desired traits of a Watch dog, Fighter and Hunting Dog and is known by its nick name the "Fighter". The origin of the Boxer Dog breed was in Germany where it was developed in the late 1800's. Boxer Dog Breed Group and Dog Type - Working Dog Group (AKC:1904): The Boxer Dog is one of the many breeds of dogs that belong to the Working Dog Group (AKC:1904). Other names for the Boxer Dog: The Boxer Dog is known by the nickname of the "Fighter". Other names for this breed of dog include the Deutscher Boxer and German Boxer. Boxer Dog History and Origin: The country of origin of the Boxer Dog breed was in Germany during the late 1800's. The Boxer was once used to entertain spectators who gambled on its prowess as a fighting dog. When bull and bear baiting was banned in the mid 1800's, breeders began developing breeds that were suited to dog fighting. The powerful and athletic Boxer was bred primarily for dog fighting in which dogs were 'pitted' against each other in special arenas called dog pits. 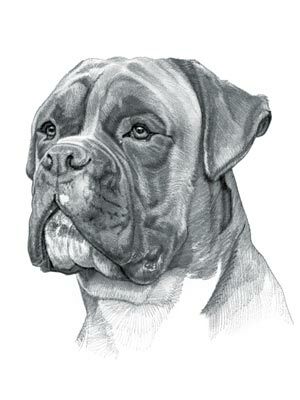 The first breeder of the Boxer was a German breeder from Munich called Georg Alt. In 1893 Herr Alt produced the first Boxer by crossing two German mastiff type dogs, the now extinct, Bullenbeiszer and the Barenbeiszer (the names mean "bull-biter" and "bear-biter" respectively. These tough, early breeds were also used to hunt dangerous animals such as wild boars, small bears and stags. In 1894, Friedrich Robert, Elard Konig, and R. Hopner exhibited the Boxer in the 1896 Munich dog and founded the first Boxer Club, the Deutscher Boxer Club. The Club developed the first Boxer breed standard which was published in 1904. As the lust for dog fighting began to decline the strong Boxer was used as all-purpose farm dogs and were employed by butchers to haul their carts as a cheap alternative to the horse. The Boxer was exported to the United States where it was utilized by farmers as cattle dogs and to round up livestock. American hunters also made good use of the Boxer as hunting dogs on hog hunts and bison hunts. The Boxer was officially recognized by the American Kennel Club (AKC) in 1904. Two strains of the Boxer gradually developed, the German Boxer and the American Boxer. The American Boxer have smaller heads and are generally less bulky than the German Boxer. The modern, versatile Boxer is used as watchdog, for guarding duties, police work, military work and search and rescue. The highly intelligent Boxer can be difficult to train but is obedient provided it receives consistent and calm direction and strong, firm handling. Boxer Dog Height: The Boxer breed is classified as a medium sized canine. The height to the shoulder of a male is 22-25 inches (56-63 cm). The height to the shoulder of a female is 21-24 inches (53-61 cm). Boxer Dog Weight: The weight of the male in this medium sized animal is 60-70 pounds (27-32 kg). The weight of the smaller female is 53-65 pounds (24-29 kg). Boxer Dog Coat Type: The coat type is described as a short, smooth coat. All Boxers have a Melanistic Mask (a dark coloration of the skin or hair typically on the muzzle and face of the dog) because of a high concentration of melanin. Boxer Dog Coat Colors: The colors of the Boxer breed include brindle, fawn, white colors. Boxer Dog Grooming - LOW Grooming Needs: The grooming needs of the Boxer are categorized as Low in order to maintain a healthy, tangle-free coat and reduce the risk of skin infections. The limited grooming needs of the Boxer are considered to be low maintenance, requiring limited attention to grooming where brushing and combing, is concerned. Grooming Requirements should include bathing the dog on a monthly basis and making regular inspections of the nails, teeth, eyes and ears. Boxer Dog Litter Size: The litter size of the Boxer breed ranges from 6-8 puppies. Boxer Dog puppies for sale can be obtained reputable breeders and from rescue centers. The cost of Boxer Dog puppies varies depending on location, pedigree history and the dog breeder. Boxer Dog Temperament and personality: The temperament and personality of the popular Boxer breed is described as Eager, Energetic, Fearless, Loyal and Plucky. Boxer Dog Exercise Requirements: The exercise requirements of this breed are moderate. The Boxer requires regular daily exercise consisting of about one hour every day. This medium sized canine has a fast, fluid, strident gait with strides of a moderate length requiring a steady walking or jogging speed by the owner to meet the dogs exercise requirements. If the dog has more energy than you do, then teach your Boxer to play ball in a chase and catch game. Boxer Dog Diet: A fully grown Boxer should be fed twice a day. A diet consisting of a premium dog food can be balanced with fresh food eaten by the family. The question is What Can Dogs Eat?. Check out our comprehensive list of what dogs can and what dogs cannot eat. Boxer Dog Health Problems: Potential health problems of the breed include Heart murmurs . Resolving health problems can prove to be expensive and it is always wise to obtain pet insurance or dog health insurance when buying a dog. Is the Boxer breed said to be Hypoallergenic? Answer: No. Boxer Dog Lifespan: The life expectancy of dogs vary according to the size, breed of dog and any serious health problems. The typical lifespan of the Boxer breed is 10-12 years. Boxer Male Dog Names: Male names are most often chosen to reflect favorite names of the owner or the strength, size, coloring and country of origin of the breed. To give you some inspiration regarding good male names our small selection might be of help with naming boy dogs. Our top male dog names are: Noah *** Rosh *** Zeus *** Max *** Buddy *** Jake *** Rufus *** Buster *** Cody *** Charlie *** Brutus. Boxer Female Dog Names: Female names tend to be softer, prettier and reflect the temperament of girl dogs. Our top choice of good female names are Venus *** Scarlet *** Siouxsie *** Twilight *** Vesta *** Cupid *** Juno *** Bella *** Cinders *** Ceres.